I have a long-time love affair going with both mashed and baked potatoes in general…just let me state that for the record right at the get-go. So a while back when baked stuffed potatoes became an actual thing, it was the potato equivalent of having your cake and eating it too, because you got the baked and stuffed part All In One Potato! Whole new vistas opened up for me, and it was only a matter of time before I worked my way to stuffed taco potatoes.It started (as so many things do for me) with the fact that I had a little leftover grilled chicken. Leftover grilled chicken is something that I try to have around on purpose, because it can lead to so many delicious things. Gazpacho chicken salad, for example. Or chicken and brie sandwiches. But in this case, I had a couple of potatoes hanging around in addition to the grilled chicken, and it’s as if all the moons were aligning the right way. Stuffed taco potatoes were about to be born. First start by finding some nice roundish potatoes. We’re going to bake ’em and scoop out the insides, and the potato “shell” that’s left over is going to be the holder for the mashed taco potato wonderfulness. So…the wider the potato, the more wonderfulness you get. Just saying. After they are baked, give them a little time to cool down just enough so you don’t singe your fingers scooping out the insides…10 minutes or so will do it. Now cut off the tops length-wise and scoop away, getting as close as you can get to the skin of the potato without breaking it. And now here comes the magic! Mash up the potato with some cream cheese, some butter, a little half and half and a nice generous dose of taco seasoning. Once your taco mashed potatoes are good and mashed, if you have some grilled chicken hanging around now is the time to mix it in. Now line up those potato skin shells – it’s time to fill them on up with your mashed potato mixture. Personally, I like to use my hands for this, but you be you when it comes to filling them up. You’re going to have enough potato mixture to heap it nice and high in the potato shell. Now sprinkle the top of each potato with some shredded cheese (cheddar and jack cheese both work well) and pop them back into the oven until the cheese is all nice and melty. All that’s left to do now is go crazy with garnishes. Personally I went with some guacamole, a little sour cream, some ground red pepper and some chopped scallions along with a squeeze of lime juice, but really the world is your oyster, garnish-wise. Salsa, sliced jalapenos, crumbled tortilla chips…go crazy. And to think, it all started with a baked potato. Scrub potatoes well, pierce a few times with a fork and bake until soft, either approximately 10 minutes in the microwave or one hour in a 350 degree oven. Cool for 10 minutes. Cut the tops off of the potatoes lengthwise and discard. Carefully scoop the cooked potato out of each potato skin, leaving the skins as intact as possible. Mash all the potato insides with cream cheese and butter. Add half and half in small increments until the potatoes are a consistency that you like (you might not need all the half and half). Stir in the taco season until well-mixed, and then stir in the chicken if you are using it. Sprinkle cheese on the top of each potato. Place the potatoes on a baking sheet and bake in a 350 degree oven for about 10 minutes or until cheese is melted. Garnish with your choice of toppings and serve at once. 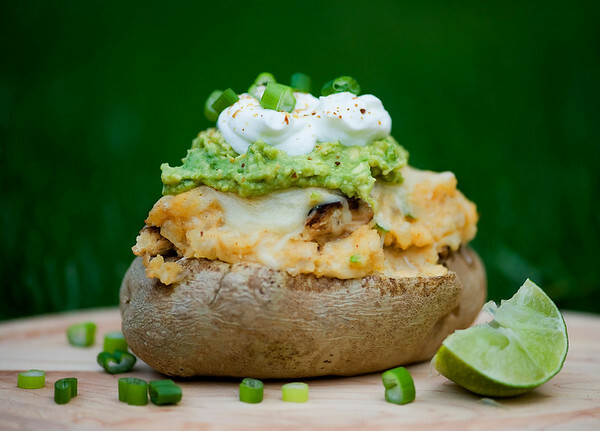 A stuffed cheesy potato topped with guac…I totally get the obsession. It sounds pretty addictive to me! It;s so nice to be back, and with a winner yet! I think you must be sending out psychic vibrations because every time I get a craving for something, I come here, and there it is! I’ve been thinking about doing this but just cutting them in half horizontally and mashing some cooked cauliflower (as an extender) in along with the tasty stuffings. That way I can heap fillings in both top and bottom and get two, two! stuffed potatoes out of one! It was your mashed cauliflower recipe that gave me the idea. Or is that what you already did? The top and bottom, I mean, not the cauliflower. I love this potato taco recipe. I’ve tried some of your recipes, and have always been happy with the results. Thank you. I’ll say! That is one stacked and gorgeous baked potato. My grandfather used to pile up his potato like that and we would try to mimic his….delicious! I just have a love affair with potatoes in general, this looks delicious! Oh my gosh, me too. A serious, long-term, never going to end love affair. I made some of these last week, and man, were they delicious. I’m actually making more tonight because they were so darn easy and satisfying. I’m so glad! They are definitely a frequent item on my menu as well. Yay, potatoes!